Description: The purpose of this Lab is to configure OSPF on all the devices and test for ping and trace commands. 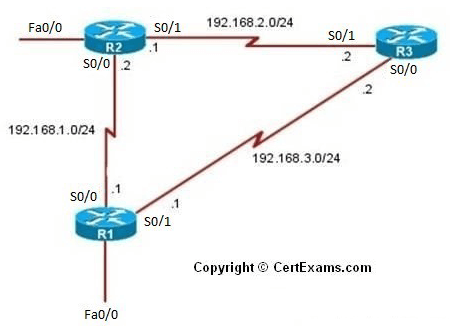 The router ospf 1 command given in the lab below selects OSPF as the routing protocol. 4. Configure the IP address as 192.168.1.1 255.255.255.0 and enable the interface status, also configure the s0/1 interface ip address as 192.168.3.1 255.255.255.0 and enable the interface status. 7. Enter 192.168.1.0 as network address , wildcard mask 0.0.0.255 and area 0 and click OK button , click add button again in Edit IP Dynamic Routing window and add the network 192.168.3.0 , wildcard mask 0.0.0.255 and area 0 in add a network window and click OK button. 9. Repeat steps 2 – 7 for configuring R2 S0/0 interface ip address as 192.168.1.2 255.255.255.0 , S0/1 interface ip address as 192.168.2.1 255.255.255.0 and network addresses 192.168.1.0 ,192.168.2.0 , wildcard mask as 0.0.0.255 and area 0. 11. Repeat steps 2 – 7 for configuring R3 S0/0 interface ip address as 192.168.3.2 255.255.255.0 , S0/1 interface ip address as 192.168.2.2 255.255.255.0 and network addresses 192.168.3.0 ,192.168.2.0 , wildcard mask as 0.0.0.255 and area 0.